The PORTARATHLON Project Team consists of experts in their field with long experience in organizing sport events. Each and every one of them is a person with vision, new ideas and resourcefulness. With a strong collective spirit, they are fully committed to deliver one of the best athletics events. 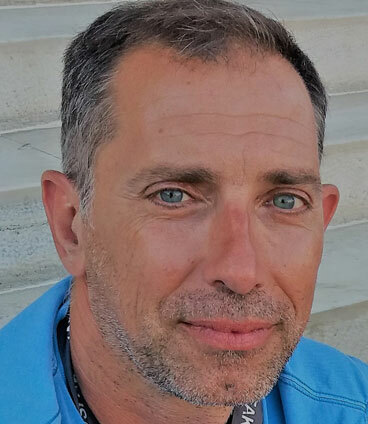 Dimitris was born in Athens, moved to New York on business for a few years and has been living in Mykonos since 2001. As the ex-President and the now Vice President of EAS SEGAS CYCLADES, he is a true rolling stone: travelling from island to island to organize athletics meetings, support local clubs and help build consensus in local communities on the importance of athletics. He also likes to study that’s why he has so many degrees! He loves athletics and that’s why he is organizing the portarathlon! Emmanouela is the heart and soul of our creative team. She loves sports as she is a former athlete on 400m Hurdles. With graphic design studies, she has become a highly-skilled art director, always thinking out of the box. Her over-25-year experience in advertising agencies has rendered her efficient, always on time and a great team player. When she is not building UFOs, she designs graphic for PORTARATHLON and other SEGAS’s events, like the Athens Marathon or she designs her own jewelry collections. Petros is the youngest member of the team. Former athlete in High Jump and lover of athletics, Petros is the Technical Consultant of EAS SEGAS CYCLADES. He graduated from the School of Physical Education in Kapodistriako University of Athens and has attended a great number of vocational seminars on all dimensions of sports. He has worked as a coach and trainer for many years. He lives and works in Naxos so his contribution is the most valuable! Dimitris is our expert on athletics. His invaluable long experience in organizing and coordinating large scale athletic events (such as the Paralympics Games 2011, the Athens Marathon and all National Championships of SEGAS) guarantees the smooth operation on the PORTARATHLON event. He has great expertise drawn on his top positions at the technical, operational and administrative level in the Hellenic Athletics Federation (SEGAS). Yorgos loves sport but he does not do any! He travels worldwide, lives in Canada, sleeps in airplanes and eats at the venues because of his work! He has worked as producer and event presentation director in Olympic Games, World Championships and International Meeting in 3 different continents (e.g. Olympic Games Athens 2004, Arab Games Doha 2011, NBA All Star Game, Toronto 2016, Asian indoor Games Ashgabat 2017). 3 athletic events with which he cooperated have been awarded by international agencies for the success of the production. With journalism studies, he had also worked as a producer in Greek TV networks for 10 years before turning his career to sports events. Despoina, a 9-time Greek Heptathlon Champion, is a School of Physical Education graduate in Kapodistriako University of Athens and an experienced physical education teacher in secondary and primary education. A distinguished athlete and many times Greek champion in long jump, she has also collaborated as a trainer and coach with major Athletics clubs and the Hellenic Athletics Federation (SEGAS). A long list of track and field women athletes have stood out at athletics thanks to her expertise and commitment. Dimitris is the member of our team responsible for the most crucial aspect of the event: performances and scores! 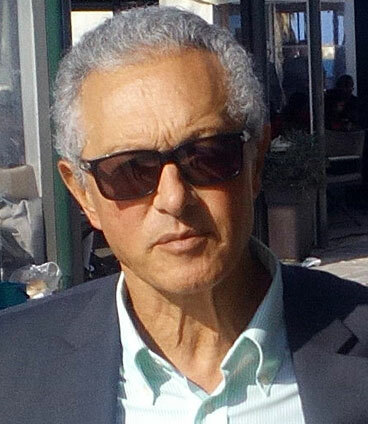 With long experience in athletics and judging, he is now the president of the Athletics Judges Union in Cyclades and the general secretary of EAS SEGAS CYCLADES. He has graduated from the School of Physical Education in Thessaloniki and works as physical education teacher in primary education. He has also worked as a Technical Consultant in EAS SEGAS CYCLADES. Yiannis is our team member responsible for the most inspirational/public-spirited part of the events: volunteers! He has been active in sports ever since he was a child in Cyclades, serving the sport ideal from every possible position. With a wealth of distinctions in Pentathlon and fencing in Greek, Balkan, European and international events, a long experience in coaching and judging both athletics and fencing, he will contribute the most in portarathlon! Manos is responsible for Sponsorship in Portarathlon event. Graduated from the University of Athens, Department of Physical Education and Sports Science with a Master Degree in Management. Despite his age has a huge experience within sports, cooperates with football and basketball clubs since 2009 and has also been involved in sport events all over Greece.